After introducing the Pizza Hut PIE TOPS, the shoes with a button that orders pizza to wherever you are, Pizza Hut has released a new commercial, promoting its deal on two medium two-topping pizzas and the smart, Bluetooth-enabled sneakers. 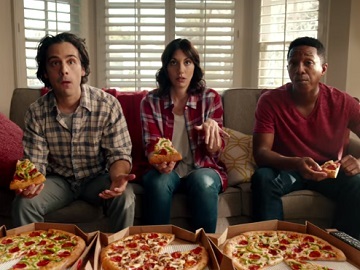 “With the press of a button, you can order two medium two-topping pizzas for $5.99 each with the new Pie Top,” the voiceover says at the beginning of the 30-second spot, which features a young woman wearing Pie Tops watching a bascketball game in the company of two friends. “Order pizza on your shoe?” one of them asks in bewilderement and the voiceover confirms, adding that “when your pizza arrives, you can even pause the game with the new Pie Tops.” Hearing the doorbell ring, the girl pauses the game to go get her pizza from the delivery guy, which makes the sportscaster ask who called time out. “It’s Jenny. Her pizza is here.” a man informs him. “Who’s Jenny?” the commentator asks and the other man points his index finger towards Jenny, saying “That’s Jenny.” He calls her name quite furious and Jenny, who’s now with a slice of pizza in her hand, tells him to calm down. “Get the Official Pizza of March Madness delivered. Two medium two-topping pizzas just $5.99 each.” the voiceover says at the end of the commercial. The Pizza Hut Pie Tops feature pattern stamped leather stitched by hand, and optimized ankle strap, and a button that orders pizza to wherever you are thanks to the built-in Bluetooth, which makes it possible to connect to Pizza Hut’s mobile app and have the pizza delivered to you if you are within a delivery area. The shoes are being produced in limited quantities (there will be 64 pairs only) and will generally not be offered for public sale. Their release coincides with the NCAA Final Four tournament. This year, Selection Sunday will take place on March 11 and the Final Four will take place on March 31, April 2.